I have tried to like housework. I really have. I have quotes scribbled into my notebooks about the Zen nature of caring for the objects that serve you well. One reminds me that caring for pots and pans we use or combing our tangled hair, is an act of self-care and should be done carefully. Another is a conversation on how to reach enlightenment, where the student asks the teacher how to do so, and the teacher replies, “Chop wood, carry water”. The student then asks what one does after enlightenment and the teacher replies, “Chop wood, carry water.” The act of cleaning, scrubbing, folding and putting away can be meditative. I have more quotes scattered around the house and Pinterest boards about how women authors balanced housekeeping and writing. (This is not a question many male authors have had put to them, nor have many commented on it spontaneously) Agatha Christie found herself plotting novels while doing dishes. I think about the episode of Big Bang Theory where Sheldon takes a menial job to free his brain for a creative breakthrough. I own books called The Hoarder in You, Love the Home You Have, and The Life-Changing Magic of Tidying Up. I have bribed myself with clothing, and lunches out of the house, and new books to try to goad myself into the domestic duties are mine to tackle. My husband is a neat and tidy person, an equal partner in shopping and cleaning and childcare when he is home. But four out of seven days he is not, and the entirety of our house’s functionality rests on me. The only way I have found to prod myself to do the right thing, when all these other things fail, is The Housekeeping Playlist. I yell along to it instead of singing. Head-banging and fists pumping in the air might be involved. 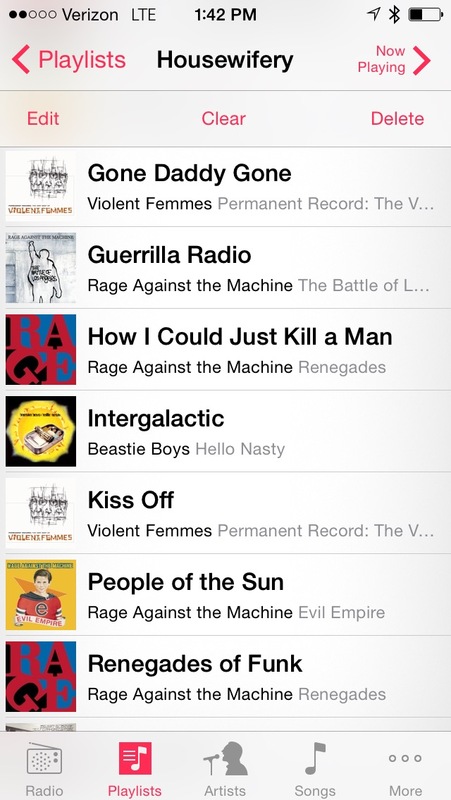 And it consists almost entirely of Rage Against the Machine songs. People of the Sun. Bulls on Parade. Renegades of Funk. Guerilla Radio. Testify. Once I get a good dose of “F*ck the system” out of my system I am ready to tackle dirty dishes and wiping down stainless steel appliances. Maybe it’s my way of announcing to myself that it’s okay that I feel pissy and whiny and don’t want to be stuck doing this. Maybe it’s the deep down irony of yelling at the patriarchy and then looking like a stereotypical housewife perpetuating the system. Maybe it’s a way for me to remember that me not wanting to clean is a ridiculously small and petty thing, compared to what bigger injustices are going on in the world. Or maybe I just need a beat and some passion in my day. I really tried to like housework. I did. Once in a while, you’ll still see me staring off contemplatively while I wipe down a counter. Or peacefully sweeping up. Or on my hands and knees humming while I scrub like Cinderella. But, if it looks like I’m having some sort of seizure through the kitchen window, the playlist is most likely why. And the house might just end up spotless.